Survive a little longer with these Surviving Mars tips. If you're reading these Surviving Mars tips, you no doubt know that getting a colony up and running in the Mars-based survival/city builder game is a tricky business. You need more than just potatoes and poop. With an erratic hint system and no tutorial, taking those first steps towards colonising the planet—which, I should add, very much wants to kill your vulnerable colonists—can be daunting. Below are a few things that I wish I'd known before I became a stressed Martian administrator. The 'Easy Start' option in the main menu is a bit weird. Selecting it flings you straight into a Martian map and removes all of the big choices you'd normally make at the start of the game. Your mission sponsor, commander, the site of your colony—all of these are chosen for you. Even though all of the picks it makes ostensibly make the game easier, it means you start off a bit clueless, having not been able to pick your rocket's loadout or browse any of the other options. If you start the game normally, you'll notice that the sponsors and commanders have clear difficulty levels, and you can still choose the default rocket loadout if you want. More important is the ability to choose where on Mars you're going to settle. When I used the Early Start, the area it sent me to had a dearth of metal deposits and frequent tornadoes. Nobody in their right mind would want to live there. You can find easier places yourself. There are a few things, like drone hubs and rovers, that you'll absolutely want to bring with you in your first rocket, but don't forget about orbital probes. After you select what part of Mars you want to set up shop on, you've then got to pick where in this region you want your first rocket to land. If the landing zone the game's picked for you looks rubbish, you can search for another one, or you can explore the areas around the landing zone, getting a headstart on the hunt for water and metal deposits. You'll be plonking down a lot of solar panels as you expand your colony, and that means you're going to really start hating dust. Mars is an extremely dusty place, and all of that red dirt loves to cling to your shiny solar panels. Unfortunately, dusty panels don't soak up as much of the sun's rays, reducing the efficiency of your extremely important power network. If you've not set up redundancies, dusty panels could cause blackouts and even halt oxygen production. Eventually you'll unlock technology that makes them less attractive to dust, but it's not something you'll have access to early on. Dust's inevitable, but you can reduce it by keeping anything that kicks up big clouds of dust away from the solar panels. Don't land your rockets near them, for example, and keep mines far away. Tornadoes are the worst, but they usually crop up in the same place, so move your panels a long way from them. You're going to need to spread your colony out to take advantage of Mars' sparse resources, making little, discrete bases. When you do that, there's a temptation to siphon life support from the pre-existing network, using pipes and cables to bring it to the new base. That's just asking for trouble. It's the first thing they would teach you not to do in Martian Administrator School. Inevitably, a pipe will burst, or a cable will break, and then that's the new base without water, oxygen or power. To make sure that these problems get fixed quickly, you'd need to have drone coverage across the whole thing, and probably a few storage areas too. It's a massive waste, and it ends up being ten times as much work as simply generating power, water and oxygen at the new base. By purchasing prefabricated buildings from Earth, you can start plonking down manufacturing facilities as soon as you want, but you should hold off until you've brought a few rockets full of colonists over to Mars. While a building can start working with only a single colonist working in it, any unstaffed positions reduce its effectiveness, up to the point where it's simply wasting resources. If you've got lots of open slots, it's probably because you don't have specialists to fill them. By changing the priority of the building, however, you can employ workers for other disciplines or unspecialised colonists. They're not as effective, but it's still better than leaving the slots open. You can also increase a building's production by creating other shifts (though this can negatively affect colonists working unsociable hours) and, by clicking the clock next to them, push your colonists harder. Once you've expanded, you're going to be moving resources around all the time. Concrete needs to get from extractors to building projects, food needs to get from farms to colonists' bellies and countless resources have to get dragged all over the planet to various manufacturing plants. Drones automatically move things to where they need to be, but only if all of the tasks are within either the rover or the drone hub's radius of influence. Shuttles go everywhere. And they're fast. They'll constantly flit between storage areas, delivering demanded resources, but they can also shuttle colonists between domes, linking them together even if they're at other ends of the map. If a dome needs a continuous supply of food, you'll still want to use a trade route with a transport rover, but shuttles are great at keeping places topped up. It's an extra layer of automation that alleviates a lot of the micromanagement. The rocket scientist mission commander gets shuttle technology straight away, making it a great choice for beginners. Some disasters—like the loss of 300 colonists—are so huge that trying to come back from them can just feel a bit too much like hard work. Sometimes it might not even be possible. 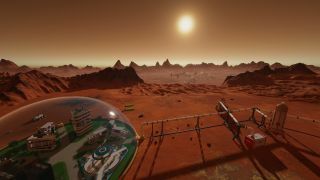 Surviving Mars provides a few safety nets, like getting resupplied by Earth, but there are some things that you just can't come back from. If it looks like that might happen, or it already has, just start fresh with a new map, and maybe even a new sponsor and commander. Even if you've got a bunch of saves, it can be better to apply what you've learned to a new canvas.